The tendinosis is a clinical syndrome characterized by chronic pain and thickening of the tendon. It usually results from overuse of the tendon, mainly workers who make repeated movements or amateur athletes. The term tendonitis has been abandoned because the suffix "tis" is commonly used to describe the presence of inflammation at some structure as in meningitis (inflammation of the meninges), appendix (Appendix inflammation), or pharyngitis (inflammation of the pharynx). 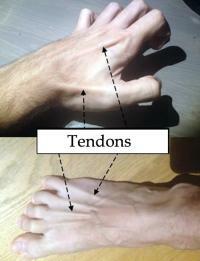 The word tendinitis therefore means inflation tendon. The fact is that most of tendinopathy caused by overuse of the tendon there is little or no inflammation present, which makes the term tendinitis inappropriate. In short, the term tendinosis should be used to describe a chronic injury of the tendon, caused by its excessive use, which was formerly called tendinitis. The term tendinitis should only be used for the few cases in which there is actually an inflammatory process of the tendon. The term tendinopathy is broader and may be used to describe any tendon injury, be it a tendinosis, Real tendonitis, rupture, etc. Made the necessary explanations to be a very dedicated term and easier recognition by the general public, it will, throughout the article, give me the freedom to use the tendinitis names, tendinopathy and tendinosis interchangeably, even though you already know that more correct is even tendinosis. In this article we will talk about tendonitis in general over the next few weeks we will prepare articles on specific shoulder tendonitis, knee, ankle and elbow. The tendon is a fibrous cord, composed of connective tissue and collagen, which exists at the end of each muscle and is responsible for fixing the same to the bones. Quite simply, we can say that the tendon is a kind of rope that is stuck to the bones, helping them to move every time the muscle contracts. It is thanks to the tendons that we can move the fingers, hands, legs, shoulders, and various other body parts. Some tendons are superficial and easily identifiable, as the tendons of the hands and feet shown in the pictures alongside. 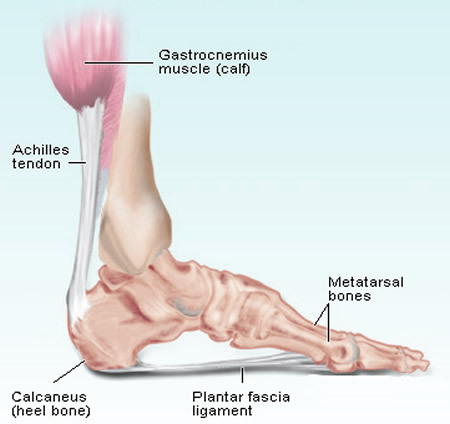 Another easily identified tendon is the Achilles tendon, also called calcaneal tendon that connects the calf muscles to the heel. If you move your fingers just above the heel bone will notice the presence of this robust fibrous cord. As the tendons are responsible for transmitting the forces of the muscles to the bones, the same are constantly subjected to tensile and mechanical stresses, which, if they occur in an intense and / or repeated, can lead to small cracks and degeneration of the tendon, especially in older individuals who already have a less elastic tendon and therefore more susceptible to esgarçamentos. The tendinopathy usually occurs when the tendon is injured by overuse and can not have a "rest" to heal properly, become more thick and scarred. Also common disorders such as areas of disorganization of the fibers, calcifications and necrosis of the tendon. As we age, our tendons gradually lose elasticity, causing, after 35 years, tendinopathies become increasingly common. The fact that in recent decades the middle-aged population have become more active contributed to the increased incidence of tendinitis, mainly of the Achilles tendon and knee tendons, elbow, wrist and shoulder. Tendinitis can occur by repetitive movements that occur at work or even during exercise, such as running, tennis, basketball, volleyball or golf. Overweight people with weak muscles or working in inadequate conditions also have more risk of developing tendinitis. 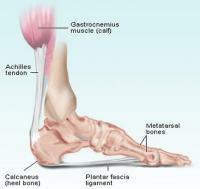 The main symptom is pain from tendonitis, which worsens when the tendon is used. In tendinopathies surface of the tendon, such as the Achilles tendon, it is possible to notice pain and thickening of the tendon palpation thereof. A swelling in the tendon of the region is also common. The specific clinical picture depends on the type of affected tendon. For example, the shoulder tendonitis (tendinopathy of the rotator cuff), the patient feels a deep pain in the shoulder when trying to make moves with the arm; tendinitis in the knee (patellar tendinopathy), there is a pain in the anterior portion of the knee every time the patient walks, climbs uphill or when sitting and rising. A tendinosis can be diagnosed only with the physical examination. When in doubt, imaging tests, such as ultrasound or magnetic resonance imaging may be requested. Often, the patient has just self-medicating for pain and delay to seek an orthopedist who specializes in treating tendinopathy. The delay in starting treatment can decrease the chances of complete cure. The first step in the treatment of tendinosis is to identify and correct the cause. inadequate positions at time of writing or typing, tennis inappropriate to run, lack of guidance from a professional physical education time to do weight training or swimming, etc., may be correctable causes of tendinopathy. For people who work with computer and have tendonitis in the arm, switching to a more ergonomic keyboard can be the solution. Sometimes just changing the height of the chair or the position of the wrist or elbow while working to reduce the burden on the affected tendon. In the recovery period, the patient should avoid overloading the injured tendon. Rest is essential. Physical therapy for muscle and tendon rehabilitation is very important in the recovery process. It takes patience, for the treatment of tendon rehabilitation can last several weeks. Anti-inflammatory drugs can be used for a short time as 5 to 7 days. Longer treatments do not have benefits and also greatly increase the risk of side effects. Ointments containing anti-inflammatory drugs may help pain and have fewer side effects than the tablets. Similarly, injection of corticosteroids can be used in a timely manner to alleviate the symptoms in the most critical phase of tendinitis, however, their use repeatedly is harmful, since it increases the risk of tendon rupture. Local application of heat or ice may be used to relieve pain. Treatment sold as of last generation, laser type, ultrasound or shock waves have more publicity than results in clinical studies. Acupuncture can help to control acute pain, but there is no scientific evidence that in the long run, there are benefits. If after 6 months of treatment there is no significant improvement in pain, should be considered for surgical treatment.